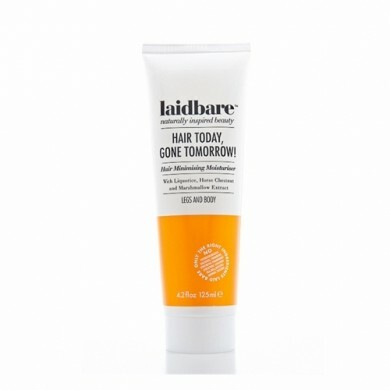 Laidbare Hair Today, Gone Tomorrow is a clever hair minimising daily moisturiser and helps to slow down hair regrowth after waxing and shaving. Hair Today, Gone Tomorrow contains a botanical complex of Liquorice extract, Caffeine & Horse Chestnut seed extract which combine together to inhibit hair growth. This citrus scented blend also acts as an anti-inflammatory to help the skin protect itself from the rigours of hair removal and reduce the chance of in-grown hairs. For legs and body. How to use: After bathing apply gel to dry skin. Use daily and after shaving/waxing for best results. Ingredients Aqua(water), aloe barbadensis(aloe vera)leaf juice, polysorbate 20(naturally derived emulsifier, glycerin (coconut)common, cyclopentasiloxane, dimethicone(silicone), dehydroacetic acid, benzyl alcohol(naturally derived preservative), mannitol(botanical), ammonium glycyrrhizate(liquorice), caffeine(coffee), aesculus hippocastanum(horse chestnut) extract, zinc gluconate(zinc irons), citrus medica limonum(lemon) peel oil, xanthum gum(naturally derived thickener), citrus aurantifolia (lime)oil, betula alba(birch) leaf extract, althaea officinalis(marshmallow) root extract, potassium sorbate (naturally derived preservative), sodium benzoate(naturally derived preservative), limonene(essential oil), citral (essential oil).